I've worn this one before, but I am going away for a few days so I was wanting something unique yet stylish and hard-wearing. "Bianca" is in my Top 10 of All Time, the formula is flawless (almost) and wears like iron on me. And of course, the colour is awesome!! If I was allowed nail polish when I went for my foot surgery, this would probably be it. I am looking at the old photo and thinking how great my nails were back then, now there is too much DIY, cleaning, typing and stuff for them to be able to grow successfully. Nevermind! :) I am sipping julmust and wishing I was back in Sweden, I hear they've got loads of snow. We've got some left, but none on the trees and the temperature is fluctuating wildly from thawing out to icy cold. Santa was very good to me this year and brought me OPI "Merry Midnight"! Thank you Weebster! :) I got it as part of a gift set with a silver cuff and OPI "Sapphire in the snow". "Sapphire in the snow" looks lovely - from photos I thought it would be dark blue creme (already have that), but it's way better; sort of blueberry purple! Quite unlike any of my other colours. Anyway back to my NOTD. "Merry Midnight" is a lovely amethyst based glitter and flakies, it's crazy sparkly and looks a bit lit from within with it's red flakes. The formula was weird; a bit sticky but runny, and the first coat was incredibly sheer. However this is two coats only, the second coat was very opaque. Lovely! This may yet make it into my Products of the Year reveiw at the New Year... :) This is my first NOTD in daylight I think, I usually am at work all day. Nice to be off for two weeks. I am not sure the camera is picking up the lovely glow. I will retake some photos in my normal conditions tonight. Still snowy - had to walk to work this morning in -4C so was wise and put my skiwear on! I felt needed something deep, soft, sensual and creme for my manicure tonight. I wanted to do some Konad in gold over to make it more festive. This is 2 coats of "Bazaar" over Sally hansen Nail Quencher base coat. 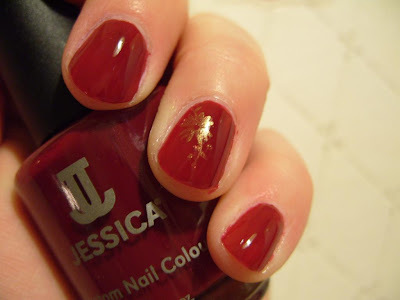 This is my first and only Jessica polish. It's almost a dupe for MAC "Rougemarie", but I am not sure if I maybe prefer "Rougemarie" to "Bazaar". This polish goes on very smoothly. It's not showing up as dark as it is on the nail in the photo however. This is my NOTD. I am loving the snow, and wanted to celebrate with a festive layering! I started off with 1 coat of Orly "Velvet Rope" over Sally Hansen Nail Quencher base coat. 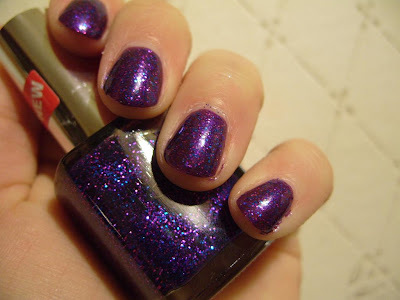 It is a nice dark purple with silver glitter. Due to getting engrossed in the "new" Star Trek movie I forgot to take photos, sorry. It is ultra-slow to dry however, that I noticed after scuffing one nail. It's FINALLY arrived and I am super-stoked about it :) No, not the parcel of nail polish from America, although that would be super-cool too. No, I am talking about snow! 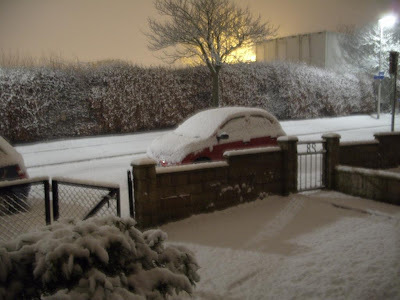 White, fluffy, silently swirling snowflakes, and there is a lot of it :) I live and park on a hill, so I am hoping my car will manage the hill... That's our Nissan Micra in the photo. I love the snow, and miss it very much. When I grew up in Sweden metres as opposed to inches of snow was perfectly normal at this time of year. I am told that it was here too, about 10-15 yrs ago. Global warming for you! Anyway, I am also super-stoked about The Body Shop is bringing back some retro stuff!! I went in there today, and there was Dewberry Bath & Shower Gel, Fuzzy Peach Bath & Shower Gel and Banana Shampoo!! I still have a Dewberry Eau de Toilette from days of yorn :) Must be at least 15yrs old. 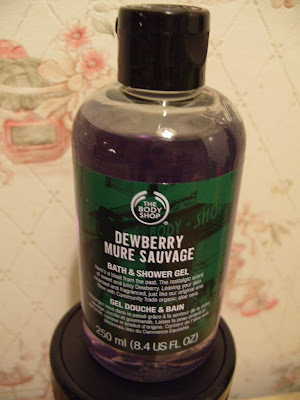 Anyway, I bought Dewberry Bath & Shower Gel as it brings back so many fond memories. Still got some Fuzzy Peach Shower Gel from last time they sold it about a year ago. This polish should seriously offend Zeke the evil beech, hehe :) This super-prismatic sheer pink from the Princess Charming collection is my new love! I picked this up in my local Sally's, where there was no OPI Holiday Wishes in sight apart from the offensive "Ginger Bells". Browsing the mainly browns and French polishes OPI display my eye fell on "Bright Lights - Big Color". Mega-lemming, hello VAT free purchase! I snapped up the last bottle. Then... Hello. You look sparkly. I picked up the bottle, tilted it to check opacity. It looked very sheer. 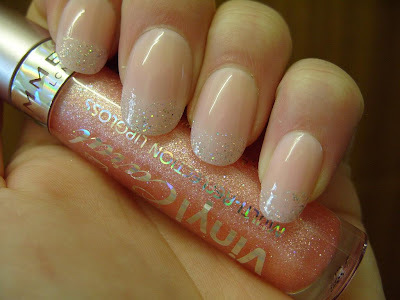 But soooo sparkly and icy pink... I hesitated, then decided to take it anyway, and layer it over pale pink creme Rimmel LycraPRO "Urban Princess". And the more swatches I looked at online the more I was convinced I'd made the right choice :D This is 1 coat of "Urban Princess" and two coats of "Princesses rule!" with MegaShine top coat. Wow! I love how sparkly it is, and how the tone of the pink suits my skintone just fine, something tricky. 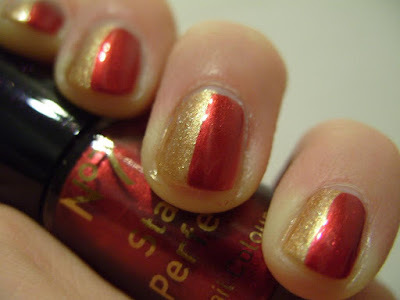 NOTD: No7 "Salsa" and Zoya "Richelle"
I am getting well and truly into the Xmas spirit here! With just over a week to go, I decided that I wanted to emulate the bottle of the No7 polish I got for my Advent Calendar at work! 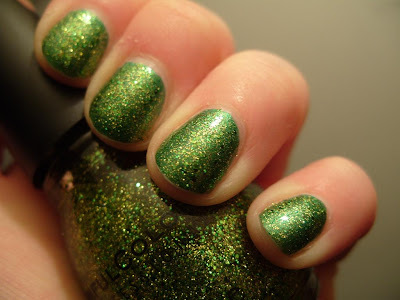 It makes Secret Santa dead easy when everyone knows you love naill polish! This is 2 coats of Zoya "Richelle" and 2 coats of No7 "Salsa" with Sally Hansen MegaShine top coat. Both polishes go on super-smooth! 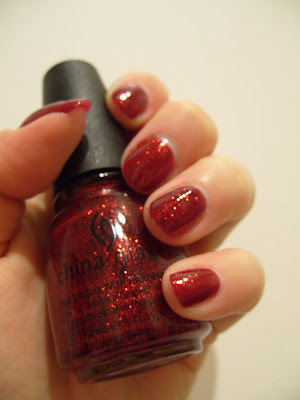 "Salsa" is a dupe for Nails Inc "Aspen", which is fighting it out as my all time fave red with China Glaze "Ruby Pumps". Also kids, Lush's bath ballistic "Happy Pill" is amazing - I had a bit of a stressful day and when I got home I so wanted a nice bath... It smells lovely and sort of fruity, but not in a synthetic overpowering way. My skin is not dry like a raisin either, and trust me I was in the tub for a good half hour... Just break the tab in two - it fizzes and smells just as much and your £2.86 lasts twice as long! This is 2 coats Color Club with 3 coats of "Heartbreaker". The darker one is 1 coat of Nails Inc "Hanover Street" with 2 coats "Heartbreaker". NOTD: China Glaze "Ruby Pumps"
I am noticing that this take quite a while to dry nowadays, even with MegaShine speed dry top coat. I am not sure what that's about. Anyone else have this problem with "Ruby Pumps" or do I just have a duff batch? Who cares anyway though, I've got a double bill of "Supernatural" to watch while it dries :) A spot of paranormal activity always soothes my wicked soul! I got these polishes about a year ago and reviewed the one called "Cherry Liqueur". 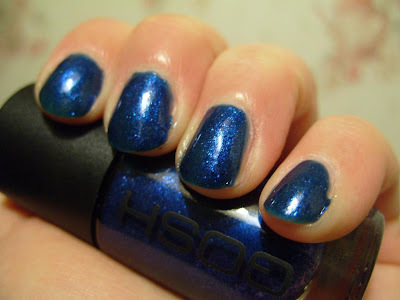 I swear I've worn "Horizon" as well but I'll be damned if I can find it on my blog! I think these are now discontinued, they were being sold incredibly cheaply on eBay for a while and I think some might still be there. 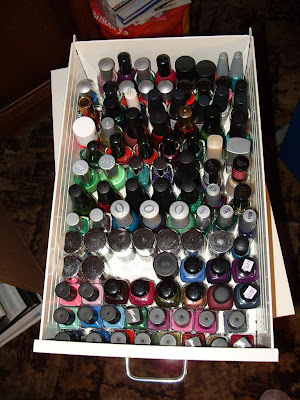 I love these polishes, I think I might be cruising eBay a bit later to find other colours... But first, I must make a cream cake! This is 3 coats, you can see some of the bubbling on my middle finger. Ooops. Oh well :) I love the pale pink frost in this. Anyway, it's bed time! This is 1 coat of Rimmel Play Fast "Camoflage" and then 2 coats of super-sparkly "Call you later" by Sinful. Very hard to capture on camera - it doesn't look very sparkly in this photo. It's actually insanely spangly and I've had so many good comments on this today! 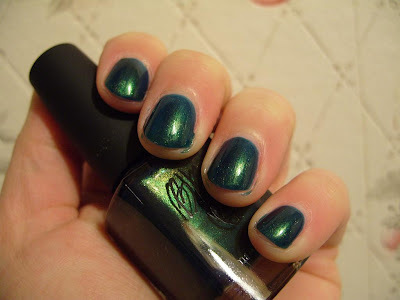 Been a bit busy lately, thought I'd just nip past and show you one of my oldest nail polishes Gallery Cosmetics "Sea Green". Still works great, no thinning. I love it :) This is 3 coats. It's a frosty seafoam green with microglitter, but it doesn't pick up very well in photos... Go by bottle colour and glitteriness for this one. This is an old favourite of mine, I think it might actually be part of the core collection for Isadora. I get these beauties from my mother from Sweden, I wish Isadora would come to the UK, as it's a great brand and has so many innovative products! 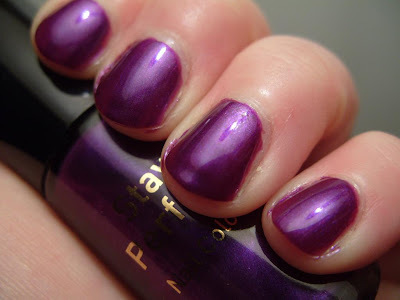 My very first nail polish was an Isadora, and it was a plummy gothic looking thing.... I think it's in the stash somewhere still.. Now what was it called... I'll dig it out one day. This is two coats with a cute nail sticker from a set I found in Boots today over Sally Hansen Nail Quencher base coat and a healthy dose of Sally Hansen MegaShine top coat. I also finally broke and bought the Pulse Perfection mascara from Maybelline. You can look forward to a review of that at the weekend!  Oh and I think that Zeke the evil beech will HATE this one :) Here's to your xmas parcel being devoid of pink, Zeke! This is two coats of each polish over Sally Hansen Nail Quencher with Sally Hansen MegaShine top coat. 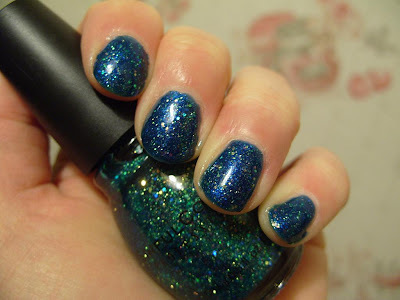 I love the name of this supremely sparkly teal polish! :) It is a bit sheer so I decided to layer over GOSH "Blue Monday". 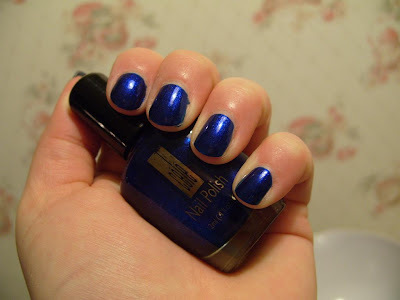 However, "Blue Monday" was also quite sheer to my dismay; I had to work 2 thick coats of it under "Nail Junkie". "Nail Junkie" is one coat only. Anyway it's hard to capture the super-sparkly nature of this layered manicure! I must've take 50 pics of each stage, but only these 2 photos turned out OK! This is with Sally Hansen MegaShine top coat and Nail Quencher base coat. 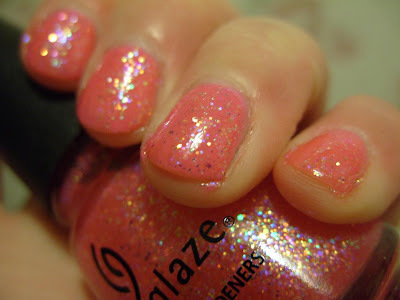 Check out Scrangie you guys, she has the China Glaze Ooh Ahz collection swatches up!!! In true Scrangie style, they are perfect and oh so desirable... I can't wait to get my hands on these! And I might faint but this review of the Orly Metallic Matte "Glam rock" has some amazing photos that makes me instantly want to get it! 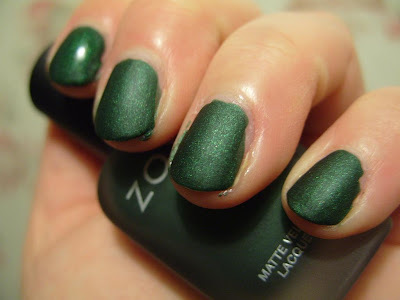 NOTD: Zoya "Veruschka" with China Glaze "Emerald Sparkle"
I use base coat with mattes as I am paranoid about staining. I used Sally Hansen Nail Quencher here, I think any shiny base coat would work, but I've got a limited supply to try. I will probably get chipping tomorrow but I don't care, the end result is worth it. 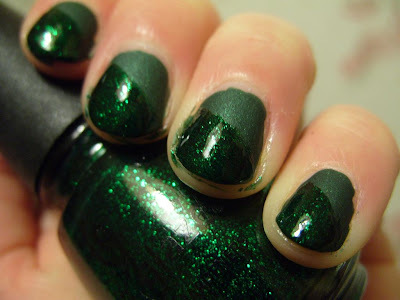 This is 2 coats of "Veruschka" over Sally Hansen Nail Quencher with one layer of "Emerald Sparkle" on the diagonals topped with Sally Hansen MegaShine top coat on the diagonals. Please excuse the messy tips, matte polishes are so fast-drying that they tend to clump up the brush a bit which makes painting a bit of a pain. Guys, seriously. No-brainer. But I've never thought about it! 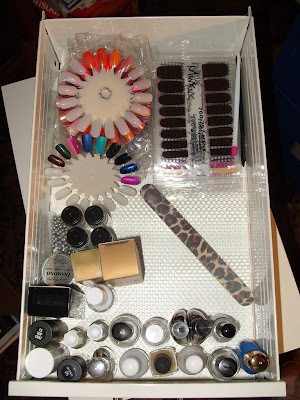 I usually let the actual pad soak on the nail for dark colours and glitter, maybe for say, uhm 30 seconds?.. But I always ends up with rubbing. So this time I tried Deborah Lippmanns technique when it was time to take off China Glaze "Bad Kitty". So, how did it go? 3) Leave it on. Seriously. For at least 3 minutes. 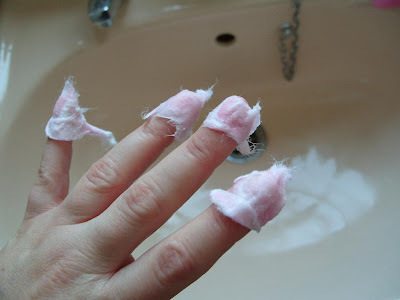 4) Jiggle the soaked cotton on the nail to loosen the polish before swiping it off. It worked for me! My biggest problem was impatience - I kept taking the first ones off to look what was happening so they needed a re-soak... :) So don't be afraid to rock those glitters, just use this technique to soak it off in under ten minutes! NOTD: China Glaze "Bad kitty"
Sometimes I really love a polish just for it's name. This is one of those polishes! But it's also a lovely polish! I used it over Rimmel LycraPRO "Urban Princess" as I still have some staining on the nails so I wanted to create a bright uniform background colour. 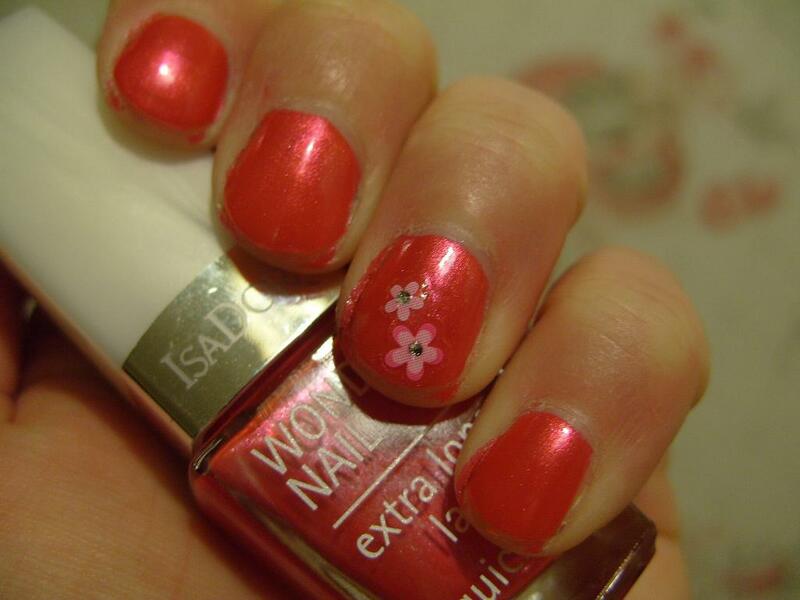 Also if I apply glitters over a creme base colour the manicure seems to come off easier with nail polish remover. 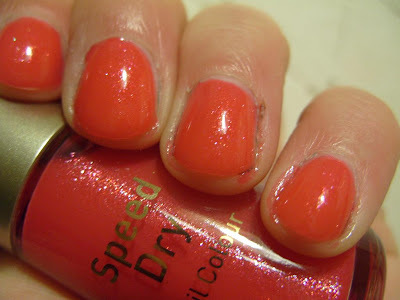 "Bad kitty" has a translucent coral-pink base colour which does well against "Urban Princess". "Bad kitty" is part of the new Speciality nail polishes. "Bad kitty" has multi-coloured glitter, and it's also slightly irregularly shaped which I love. I couldn't get very good photos of this, the camera doesn't pick up the sparkle; I will have to try in daylight. It's super-sparkly, rest assured! This is 1 coat of "Urban Princess" with 2 coats of "Bad kitty". I used it over Sally Hansen Nail Quencher base coat with Sally Hansen MegaShine top coat. 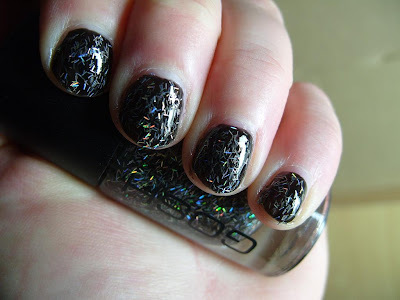 You might need 2 coats of top coat to seal the glitter in properly. NOTD: No 7 "Cherry Tang"
Oh No 7, you are too good to me this Xmas :) First the awesome "Totally Teal", the I spot this today - and with a money-off voucher it was effectively £1.25! Sweet... There is also a gunmetal shimmery one, but it's too close to Revlon "Steel her heart" to make it into my collection. This is a luscious jelly with glassfleck shimmer, the colour isn't cherry as I would describe it; more glacé cherry - the ones you get in tinned fruit salads. 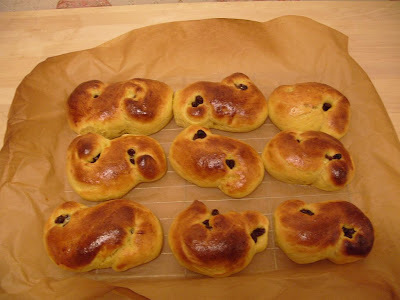 It's lustrous and lovely, and the camera hates it... 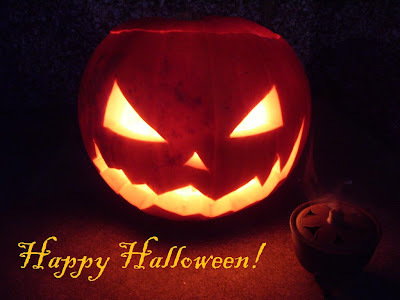 I hope I caught some of the lustre for you! This applied flawlessly. This is 3 coats, as a jelly it will need it but it's still lusciously translucent and lustrous. 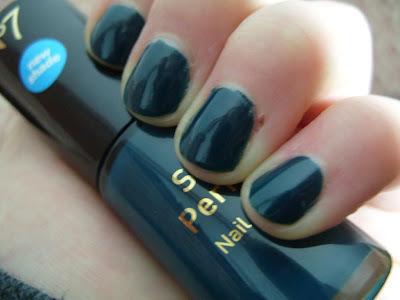 My new Holy Grail base and top coat combo is working incredibly well - I wore "Totally Teal" for 4 days without any chips :) I hope I can find another bottle of Sally Hansen Nail Quencher base coat when I need it, there are rumours they are discontinuing it. I also hope Sally Hansen doesn't discontinue MegaShine; after it's mini-revamp it's the ultimate speed dry top coat, and it doesn't go goopy half way through the bottle as Seche Vite does. In my last dip into No7 nail polish, I said that the colours in the collection usually don't really appeal to me. This one is different. Very different. It's dark and murky teal creme finish makes my knees weak. 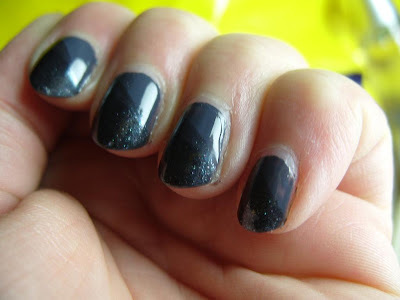 It's blackened, but in a soft way, looks amazing in the sunlight and only require 2 coats. This one had a duff brush on it, which always kind of annoy me. I had to trip it with scissors. It's also incredibly hard to photograph. This is 2 coats of polish over Sally Hansen Nail Quencher with Sally Hansen MegaShine top coat. This is a fantastic colour!! I had a tiny bit of hardship photographing this, the colour doesn't react well to the daylight lamp, and other artificial light is not good enought to show the luscious purple-y dusty rose colour. It's a very "normal" colour, but due to the dusky quality of it, it is also very different :) I am hoping to get some daylight shots of this to see how it turns out. I just don't like any of their colours. I apologise for the awful photo, I can't seem to get a proper photo of this polish. It's awesome. Truly amazing. I will try and get another photo tomorrow of this in the sunlight :) I am in love with this; it's 2 coats over 1 coat of Rimmel 60sec "Blackout" with Sally Hansen MegaShine top coat. 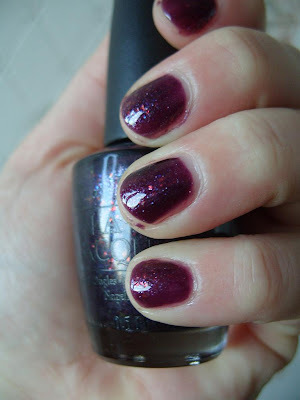 NOTD: L'Oreal "734 Black Red"
Wow, I am in love! 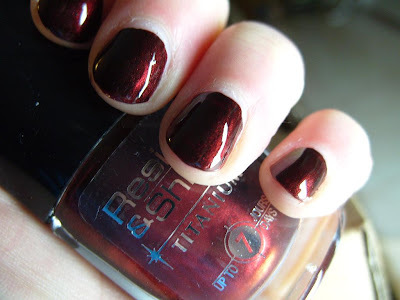 L'Oreal has brought out some blackened polishes in their Resist & Shine Titanium range, and this is the most awesome of them - 734 Black Red. There is also a purple, mauve, gold glitter and turqoise. This is ONE coat of polish over base coat, it's amazingly pigmented :) And it glows from within with a deep metallic red :) I put Sally Hansen MegaShine on and it glows even more! It's mesmerising. I don't have any other polishe like this one, and I would love if they did a hot pink/fuschia version of this! This has been a most busy week even though I was on holiday, and I've finally got to the point where I can sit down and share my Helmer with you all!! The above is drawers 1-6, top to bottom. I arranged them by brand as I think I would struggle to organise it all if they were arranged by colour group. 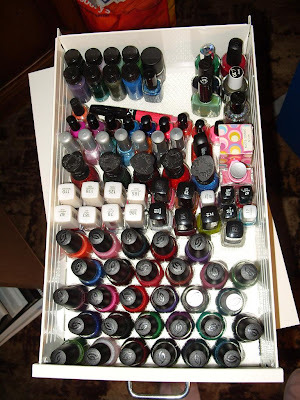 Drawer 5 is all my treatments and Minx and colour wheels, all the other ones are polish. 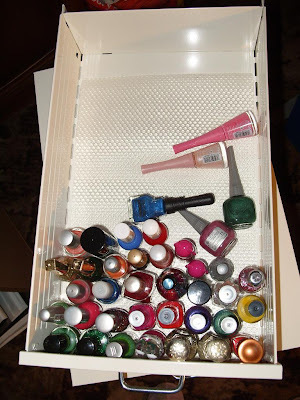 I had to do a huge cull however before I put them into the Helmer, or I would have struggled to put everything in... 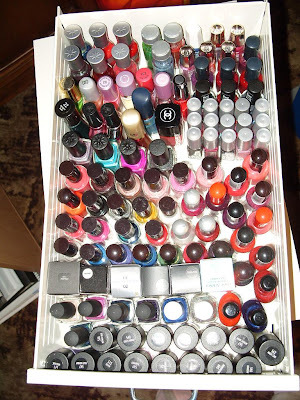 I've not actually got a lot of OPI, my most plentiful brands appears to be China Glaze, Rimmel and Barry M! 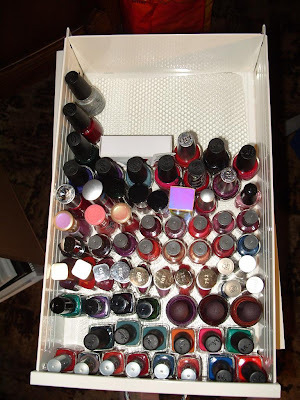 I put IKEA plastic drawer liner in all the drawers to stop the bottles sliding around when you open the drawers. 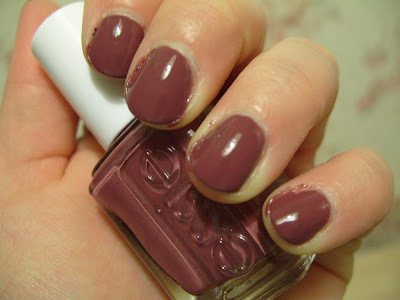 Secondly, my NOTD - one of the top 10 of my nail polishes - Urban Decay "I.D." This is 3 coats over Sally Hansen Diamond Strength base coat and Sally Hansen MegaShine top coat. This is the only nail polish in my collection that has a backup bottle... I scored some old classic Urban Decay nail polish in Superdrug for a couple of pounds a couple of weeks ago, including my all-time lemming "Bruise". You can look forward to that one later in the week! 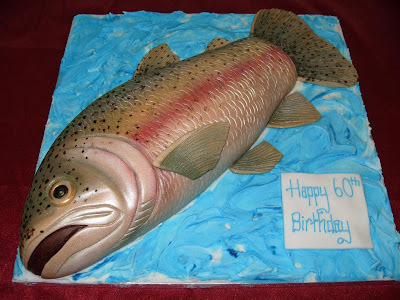 Today is my Dad's 60th birthday, so we gave him a killer cake - can you tell he's a keen sports fisherman?? Happy Birthday, Dad! :) A big thank you to the girl at Cake Magic for this awesome creation! 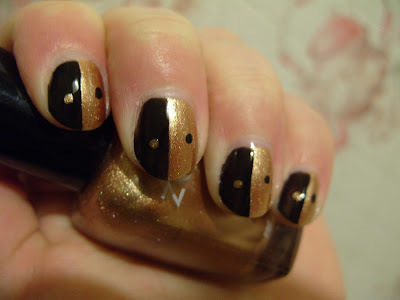 My NOTD is Depend #169 with diagonals of #173. This is 1 coat of charcoal grey creme #169 over Sally Hansen Diamond Strength base coat and then diagonals with the gunmetal grey glitter #173, topped with Sally Hansen MegaShine top coat. 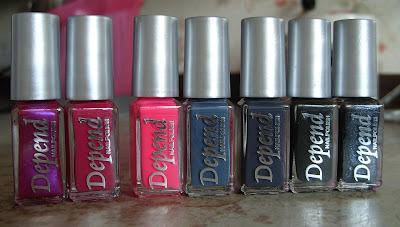 I love Depend nail polish, I wish they had bigger bottles :) I struggle to photograph as we have major rain storms here at the moment so I had to use my daylight lamp again. We are off for to a nice local Mexican restaurant now for my Dad's birthday dinner, but hopefully I can give you the low-down on my new exciting Helmer tomorrow night! Nail polish haul from Sweden! Been a tad busy with my mum and dad coming over to stay for a week but I got a quick update for you with some Swedish Depend nail polish. This is from left; 69, 167, 34, 170, 169, 173 and 104. 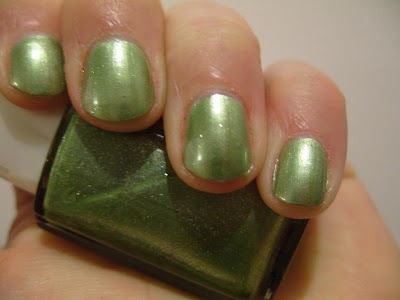 #173 is a really dark bottle green creme, sort of a really dark version of Illmasqua "Rampage". NOTD: Color Club "Fashion Addict"
I've been wanting this polish since I got "Revvvolution" but just couldn't justify spending money on shipping for it. Suppose that's what friends in other countries are for :) I tried sooooo hard to catch the lilac base colour of this polish but to no avail. It just looks like a greyish holo in whichever light I try to photograph it in... Hope you can forgive me. 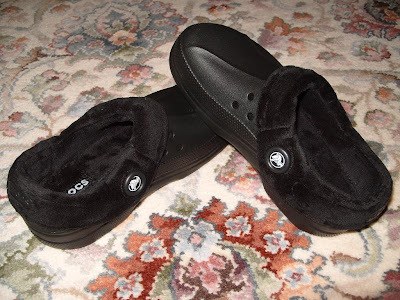 Anyway, back to "Fashion Addict". This is 2 coats over Seche Clear. 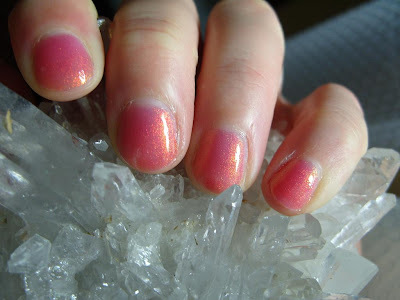 I find you need a shiny base coat for holos as it seems to go flat with the textured ones like Nailtek II Foundation. 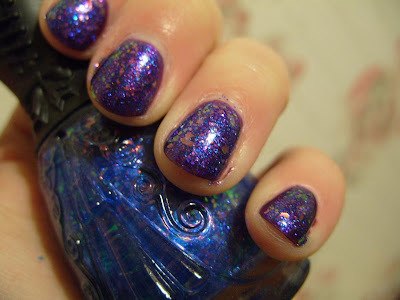 I also don't put a top coat on holos as that too seems to flatten the rainbow effect. 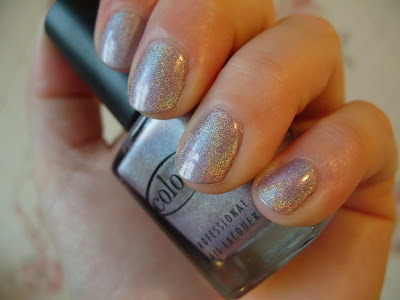 As most of my holos it doesn't last very well, it sort of gets rubbed off the nail leaving little bare patches. But I enjoy it while it lasts! :) And it's not such a pain as glitter to remove! 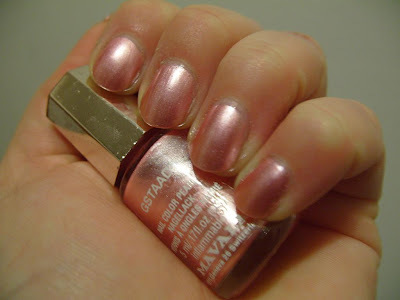 NOTD: China Glaze "Fortune Teller"
I love this polish :) There really isn't much else to say. It's gritty and gloopy like a glitter but it's still totally cool!! 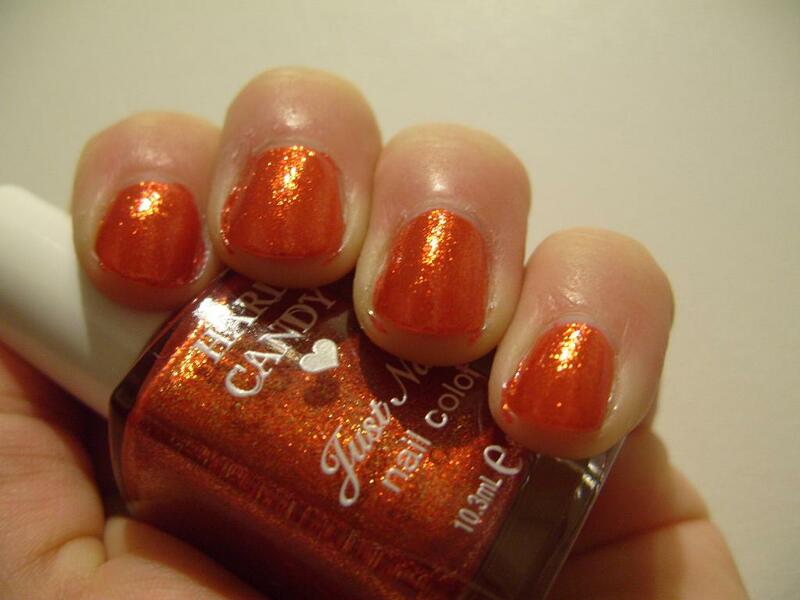 This is a Sally Beauty exclusive Halloween polish, so not easily come by here in the UK. This is 2 coats over Sally Hansen Diamond Strength and with Poshe top coat. Woohoo! It has various sizes and shapes of the glitter including some octagonal ones. Amazing. Why this is limited edition I do not know, this should be part of their core line! 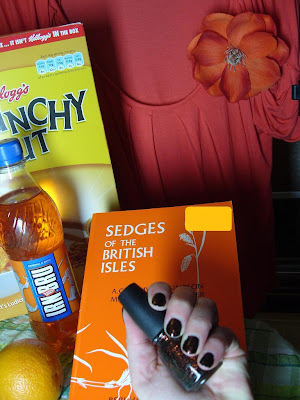 Maestra tagged me for a challenge to find and photograph 7 random things from a colour theme: ORANGE. Cool I thought, so I got to work! I thought about it all day too! 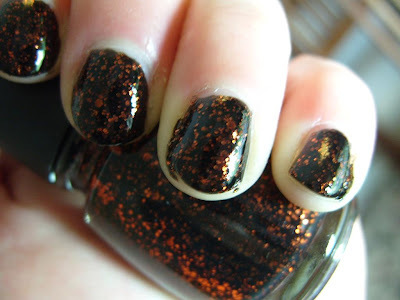 NOTD: Fortune Teller - totally rockin' black w orange glitter nail polish for Halloween!! Orange Primark top - one of my favourite tops! Flower brooch - so big, so bold, so me! Crunchy Nut Cornflakes - Love these things in the morning! BSBI Sedges of the British Isles - my boyfriends' book, the only one I can never ever learn anything from no matter how many times I read it! ..and your colour is... GRAY! 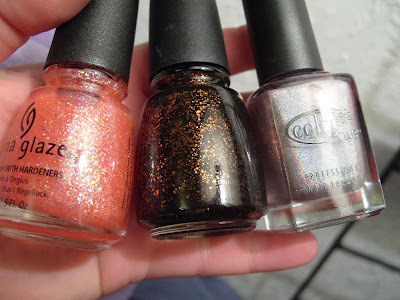 Also I got China Glaze "Bad Kitty" and "Fortune Teller" and ColorClub "Fashion Addict". This is the first time I've got AMAZING polish like this in the mail but looked at my current manicure and thought "No, I think I will wait to change this manicure until tomorrow, it's too lovely to take off!"